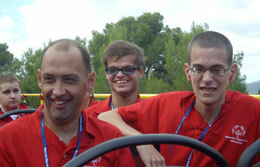 Special Olympics Gibraltar celebrates its 25th Anniversary, holding it’s National Games on 1st, 2nd, 3rd June 2010. Venues and times are detailed below. The goal of Special Olympics is to bring all persons with intellectual disabilities into the larger society under conditions wherby they are accepted, respected and given the chance to become productive citizens, thereby celebrating the similarities we all share.